The re-imagined Pier A Harbor House illuminates Lower Manhattan now that it has opened its doors to the public for the first time in 127 years. 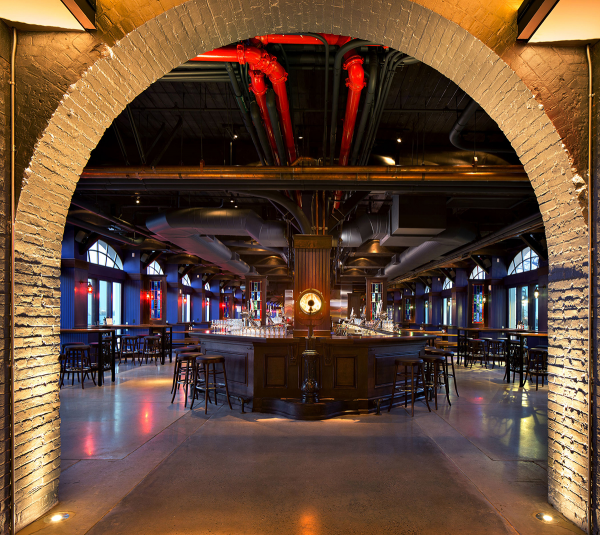 Pier A’s partners, Danny McDonald, Michael Jewell and Peter Poulakakos, tasked visual lighting expert Michael Riotto of MRD and Vincent Laino of Green Light Architecture to enliven the historic pier following an extensive restoration by the Battery Park City Authority and H3. The design teams were challenged to transform the landmark pier into a thriving multi-purpose culinary and events destination, while giving it a distinct New York City identity. 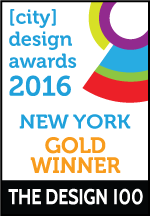 MRD is a design-build lighting company. 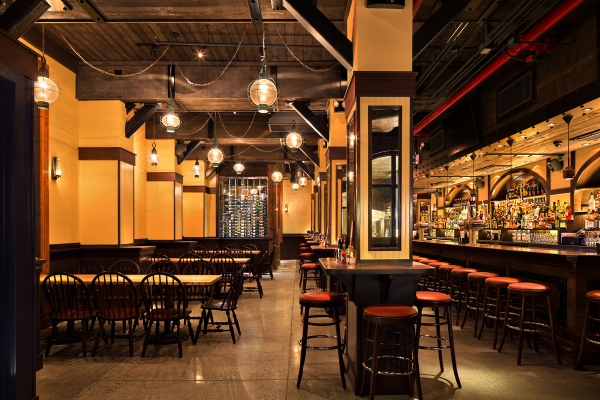 The firm, which is based in New York City, is best known for its excellence in lighting, design-build, and custom fabrication capabilities ranging from new construction to renovations to specialty visual systems. Using sustainable materials and practices, they also have earned a reputation for developing custom lighting fixtures and controls to support their concepts. The MRD staff manages all aspects of project work from design and consultation through product development, sourcing, specification and installation. Since opening in 1886, Pier A has served as the headquarters for the city’s harbor police, fire department and a beacon of welcome for European Ambassadors traveling to Ellis Island. Pier A was added to the National Register of Historic Places in 1975 and was designated a New York City landmark in 1977. After falling into serious disrepair, the location’s restoration was initiated by the Battery Park City Authority in 2008. 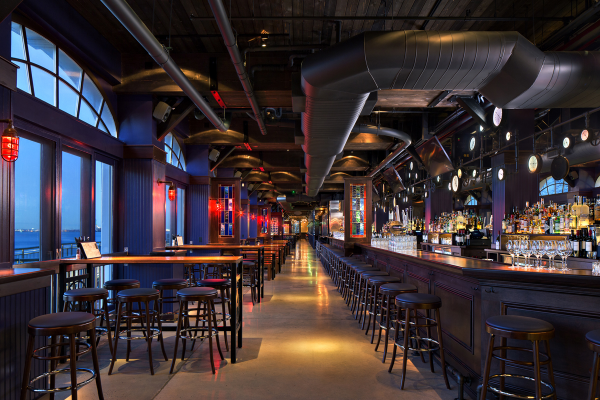 The structure now stands as a fine example of adaptive reuse on a micro and macro scale, and as a go-to NYC destination with a riverside bar and restaurant complex. Given MRD’s extensive maritime experience and Pier A’s dockside location with stunning Hudson River views, the team was inspired to transform the building to resemble a ship’s interior. The lower floor represents the utilitarian spaces, like the engine room, while the upper floor represents the crow’s nest and captain’s quarters. From a pendant decorated with repurposed pressure gauges to custom brass lighting fixtures, the building glows from the inside out and mimics the calming movement of the ocean. The MRD team employed both traditional and state-of-the-art lighting techniques to give the building a unique New York City identity. MRD tapped into their knowledge of the marine industry to inform the design. 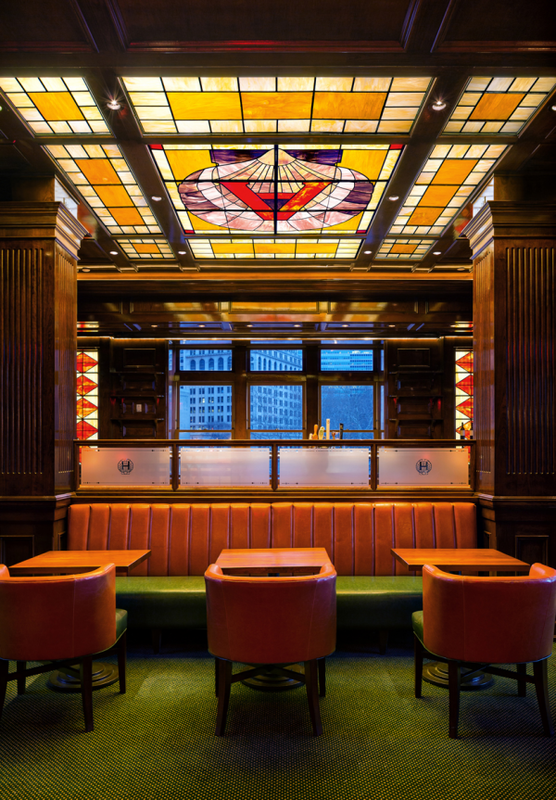 For example, they used red and green lighting markers, always found on ships as navigational lights, to define the Beer Hall and create a way finding feature. MRD combined current lighting technology with authentic lighting fixtures to keep the project’s marine theme and remain respectful of the pier’s history. 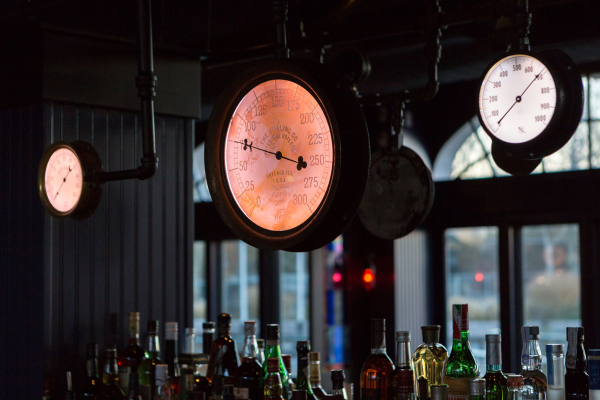 One of the best examples is the gauge pendant over the Long Bar. MRD sourced 150 American made gauges that date as far back as the mid-1800s. They refurbished these vintage fixtures and fastened them to a blackened iron pipe system. 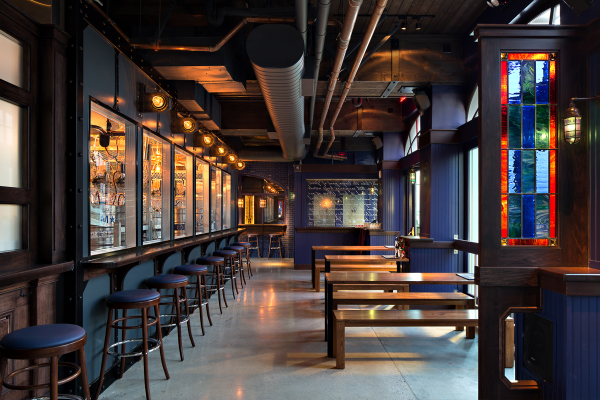 By utilizing RGBW LED lighting with controls, MRD gave the fixture full dimming and color changing capabilities. 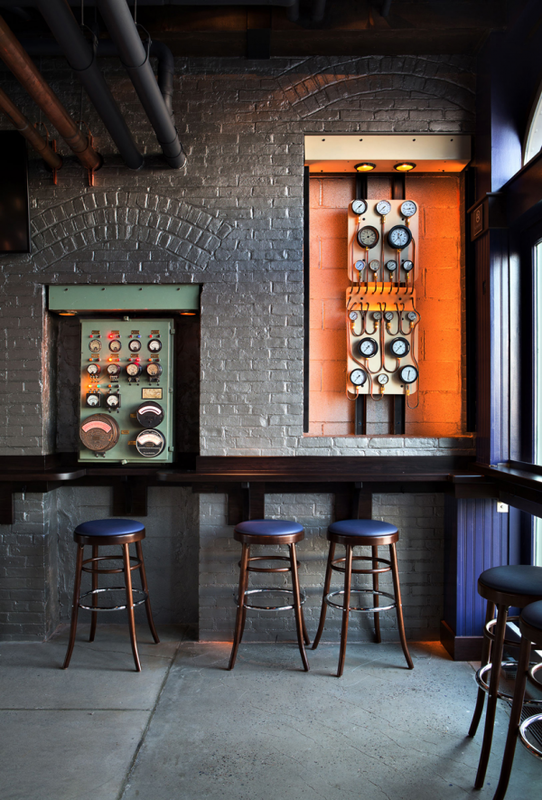 All elements of the fixture, including the gauges, iron pipe, hardware, copper wiring and LEDs, were made in the U.S. 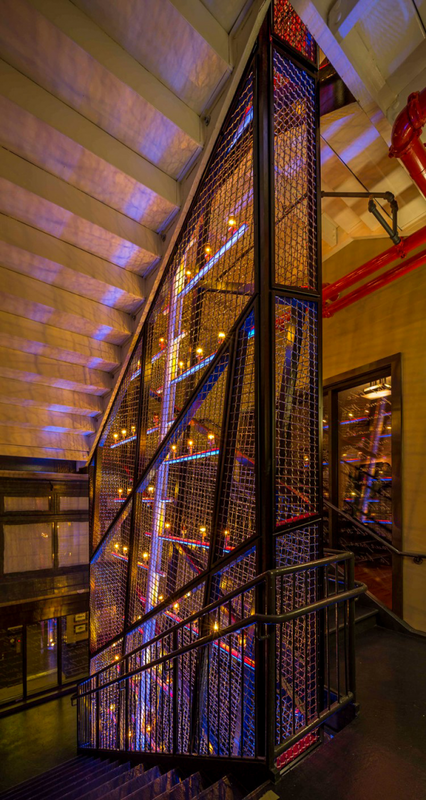 The iconic search light stands at the entrance and leads guests into the Beer Hall. This was the last original search light from the historic building as all others were broken, stolen, or lost. MRD restored the fixture with a number of custom design solutions and strengthened the fixture with blackened hardware to maintain its authentic appearance. In 1977, Pier A was designated a New York City historic landmark. While this gives the building a certain appeal, MRD had to consider the effect their fixtures would have on the building's historic details. MRD developed a lighting plan that respected the building and its history while providing relevant and current lighting technology to bring the space into the 21st century. 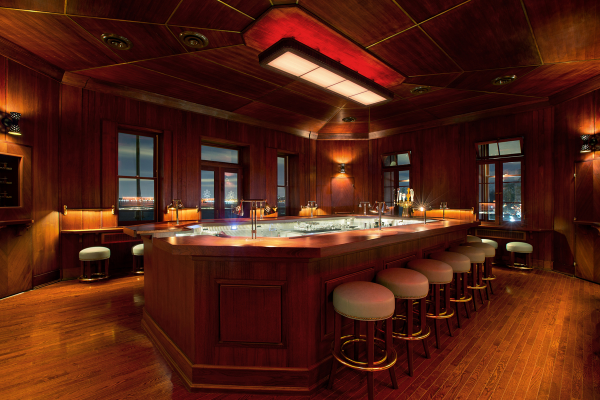 MRD needed to illuminate the perimeter of the Commodore’s Room, a bar on the second floor, without damaging the original teak walls and ceilings that were fully restored. They designed and fabricated a series of brass rails embedded with a linear warm white LED to softly down-light the dry bars. 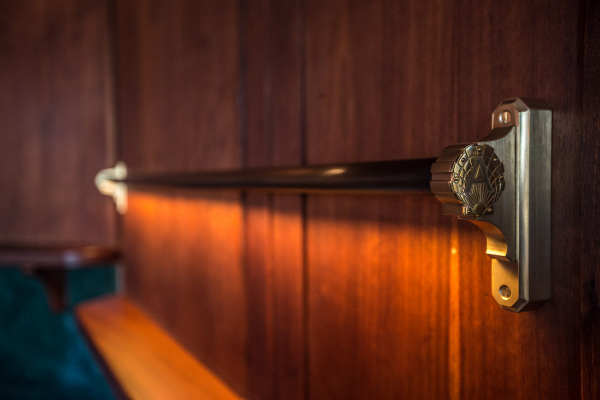 The rails were supported by custom brass brackets featuring the crest of the pier’s logo. All brackets were designed with minimal mounting locations to allow for a simple installation and preserve the integrity of the historic teak walls. MRD reconfigured the internal components of the original ceiling pendant in the Commodore’s Room. By replacing the incandescent bulbs with a custom designed LED panel, MRD created a very high tech lighting fixture. The pendant was re-mounted using the ceiling’s existing holes to protect the teak ceiling. MRD’s approach to sustainability focused on using LED technology, refurbishing original fixtures from the pier, bringing in vintage elements and using locally sourced materials to achieve their design goals. The building was rated LEED Silver, so there was a limited amount of available electricity running into the building. By incorporating LED lighting into their fixtures, MRD was able to meet the flexibility and functionality that the client requested, while also considering longevity and sustainability. The only way to effectively complete this project was to be an expert in design, build, and custom fixtures. MRD found the most efficient way to do this from a design, technical and financial perspective and using LEDs played a major role in their success.